Did Al Jazeera's undercover investigation into One Nation overstep the mark? The sheer audacity of Al Jazeera’s three-year ruse is astounding. The news company’s investigation unit has carried out a sting that has captured both the National Rifle Association of the United States and Australia’s One Nation Party in all sorts of compromising positions. The series, “How to sell a massacre”, has exposed the NRA’s manipulative media practices and revealed One Nation’s desire to cosy up to the US gun lobby to find ways of funding its domestic campaign to overturn our gun laws. The documentary has exposed the thinking of some of the party’s most senior figures about taking control of the parliament and their obsession with Muslim immigration. How to Sell a Massacre P1 | Al Jazeera Investigations. Al Jazeera senior producer Peter Charley did this by placing actor-turned journalist Rodger Muller in the field to impersonate the head of a fake pro-gun lobby group called Gun Rights Australia. The pair then pandered to One Nation’s desire for financial support and international endorsement and exploited US gun lobbyists’ fears about Australia’s strict gun laws. They got away with this for three years, gaining unprecedented access to the halls of the NRA and to the minds of two One Nation officials, Queensland state leader Steve Dickson and the party’s controversial chief of staff, James Ashby. There are at least two ethical questions about this documentary. The first is whether the producers have overstepped the mark by not only reporting what they saw but creating the scenario in which the events occurred. The second concerns the program’s extensive use of hidden cameras. On the first matter, the issue is whether the program created the meeting between One Nation and the NRA and therefore acted irresponsibly by entrapping the subjects of the film. When I approached One Nation Chief of Staff James Ashby and mentioned my NRA connections, he told me he wanted to visit the US to meet them. I set up meetings in Washington and soon Ashby and One Nation’s Steve Dickson were on a flight to the US. This suggests that Muller and Al Jazeera were catalysts and enabled the connection between One Nation and the NRA. But it also demonstrates that there was a desire on the part of One Nation to meet the US gun lobby, and – as later becomes clear - the party was motivated to do so to raise funds and make political connections. So is this responsible journalism? 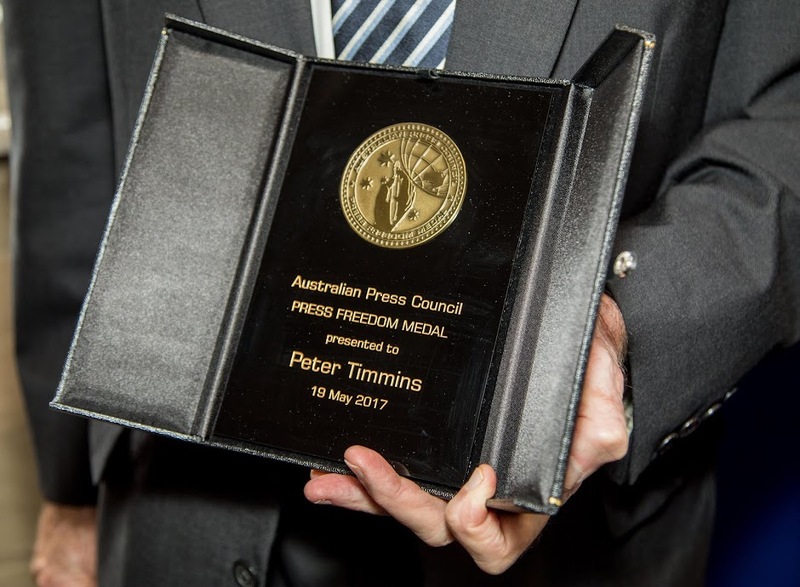 The Media Entertainment and Arts Alliance code of ethics – the protocols by which thoughtful journalists operate in Australia – is largely silent on this issue. It doesn’t say anything explicitly about creating the news by making connections between players to observe what happens next. But it does stress the need to “report and interpret honestly”. It calls on reporters to use “fair. responsible and honest means to obtain material” and to “respect personal privacy”. But the code also acknowledges journalists both scrutinise and exercise power. The preamble makes the point that journalism animates democracy. ethical journalism requires conscientious decision-making in context. It allows for any of its other clauses to be overridden to achieve “substantial advancement of the public interest”. So is it wrong to make and enable connections that might not otherwise happen in order to observe the outcomes? Is this fair and honest and responsible? Like many things, the answer might be dependent on the motivation. From where I stand, it looks like Al Jazeera’s motivation was to get to the heart of something fundamentally important that would otherwise remain opaque. And while we’re pondering that one, there’s the perennial ethical question about hidden cameras. This isn’t your garden variety case of a tabloid TV program exposing a dodgy car salesmen or a real estate scammer. In this film, the use of hidden cameras directly places several parts of the code of ethics against that all important public interest override. The question is whether the public’s right to know is so important that it justifies the film’s deceptive conduct and breaches of privacy. For me, the use of hidden cameras can clearly be defended when a publicly funded Australian political party, that knows what it’s doing is dodgy, is making connections to “change Australia” by gaining the balance of power in the parliament and “working hand in glove with the United States”. It is highly likely the extent of One Nation’s behaviour could only be exposed through this sort of reportage. James Ashby is captured repeatedly reminding others they need to be secretive in their dealings with the NRA. The public has a clear right to know what One Nation is up to. This is especially the case when part of its mission is to learn new techniques to manipulate the public debate to pursue an agenda of overturning the ban on guns following the 1996 Port Arthur Massacre. There’s something else about this program that justifies the use of hidden cameras. It exposes the utter cynicism of the media messaging and media training that underpins the NRA like nothing I have ever seen before. In a closed meeting with NRA officials, One Nation is given a crash course on how to deal with bad press, particularly following mass shootings. Lars Dalseide, an NRA media liaison officer, is captured saying pro-gun lobbyists should smear supporters of gun control by accusing them of exploiting the tragedy. How dare you stand on the graves of those children to put forth your political agenda. If your policy isn’t good enough to stand on its own, how dare you use their deaths to push that forward. As he says this, Ashby is recorded replying: “That’s really good, very strong”. Some of that phrasing seems familiar in the immediate aftermath of the Christchurch massacre, suggesting parts of the NRA’s playbook have already made their way down under. This documentary underscores two things. The brutal tactics of the gun lobby and the operations of One Nation need exposing. Journalism sometimes has to take on the unsavoury job of extracting the truth from those who do not want to share it. In the Estimates hearing for Department of Prime Minister and Cabinet this week Senator Rex Patrick referred to an FOI knockback that suggested meetings of senior officials are confidential, and put the department on notice that he is going to challenge. "I haven't lost one yet. So maybe you want to go back and reconsider a decision on this particular issue." Senator PATRICK: I've just got a couple of questions—perhaps to you, Ms Foster. Mr Duggan might also be helpful in this regard. I put in an FOI—and I don't want to prosecute the FOI, but it raises a more general concern I might have—for access to a diary. It was the secretary's diary, actually. In response to that, the words came back that the diaries obviously contain details of meetings between the secretary and senior officials of state and territory governments, that information about those meetings is not in the public domain and that, further, there's an implied understanding between the Commonwealth and the states and territory authorities that details of these meetings are kept confidential. I just want to narrow in. Is this some sort of state-to-federal-government agreement that exists with the secretary, or is it more generally a claim that there is an implication that meetings that are held between federal officials and state officials are always secret? Ms Foster : Let me just get the expert up to the table so that we can answer you very precisely. Senator PATRICK: So there's no implied understanding that the existence of a meeting should be held secret, because you could imagine that anyone listening would think that something that would occur in Stalin's times is that there is general secrecy when public officials, who work for the state, are paid for by the state and work for the public—and it's the same on the federal side—meet. In fact, the FOI guidelines are quite good and case law is quite good, in that what normally could be protected—and there is a threshold to that protection; it is not a blanket protection—is that the communication that is taking place at those meetings is held to be confidential, not the meetings themselves. By way of example, when Mr Dreyfus sought to have access to Mr Brandis's diaries, the judge made it very clear that a meeting between the Attorney-General and ASIS cannot be withheld. It doesn't go to what they talked about, but one would expect the Attorney-General to talk to ASIS on a regular basis. So is there some understanding that the fact of a meeting taking place between state officials is to be withheld from the public? Is that the case? Senator PATRICK: Yes. That's the threshold I was referring to. But the words were very clear: 'There is an implied understanding between the Commonwealth and the states and territory authorities that details of these meetings are kept confidential.' So that there would be an implied understanding of confidentiality of the fact of a meeting taking place. Senator PATRICK: But, for example, having a meeting with a Murray-Darling Basin state or having a Mr McCormack meeting with a state transport minister would surely not be confidential? Senator PATRICK: Sure. That's what I'm getting to. Ms Foster : covered by that. But, in some cases, that is the case. As you'd be aware, with each FOI request, we look at each document and assess it on a case-by-case basis. We're not making a generic statement about such meetings but saying that, in this instance, we believe this exemption applied. Senator PATRICK: This actually makes it very clear: there's an implied understanding between the Commonwealth and states and territory authorities that details of these meetings are kept confidential. Which is why I said: is it only the secretary of PM&C that that applies to, or, more broadly, everyone? But you're saying that's not the case. Ms Foster : What I'm trying to say is that I think that statement was setting the context for us to apply in this specific case, because if, indeed, there is nothing sensitive, then there is no reason to withhold. Senator PATRICK: and, possibly, the AAT. But I'll give you a bit of a tip: I haven't lost one yet. So maybe you want to go back and reconsider a decision on this particular issue. Ms Foster : Certainly, Senator. Records on private devices could be subject to FOI-but are they kept? Secure messaging services like WhatsApp often feature in the news in the context of their potential use by terrorists. But paradoxically they are now used increasingly by Commonwealth government ministers and other senior officials. This raises important issues in terms of record-keeping, and whether messages on these services are accessible via Freedom of Information (FOI). What is FOI and what documents does it apply to? FOI laws are designed to make governments more open and accountable by providing access to documents that shed light on their activities. The Commonwealth FOI Act applies to the individuals and bodies that make up the Commonwealth government sector, although it excludes some specific bodies and documents. The Act provides access to information held in documents, including electronic documents, as well as pictures, videos and more. To be accessible a document must be in the possession of a government agency or a Minister. It must also exist in material form, although there is also scope for the creation of a document from a database using a computer. The right of access under the Act does not extend to exempt documents. The Act contains 18 exemption provisions designed to protect the interest of agencies, third parties as well as broader governmental interests. For example, a document is exempt if it qualifies as a Cabinet document or it reveals internal decision-making processes contrary to the public interest. Agencies and ministers are permitted to withhold documents, or parts of documents, if they qualify for exemption. They may also refuse requests for access on workload grounds or because the documents requested cannot be found. Applicants who are refused access are able to apply for review by the Australian Information Commissioner. The Act also provides for further review by the Administrative Appeal Tribunal and appeals on questions of law to the Federal Court of Australia. To what extent can FOI be used to obtain access to ministerial documents? Journalists who want to investigate a Minister’s conduct may be able to obtain the information required from a government agency within the Minister’s portfolio. They are also able to obtain access to documents held by Ministers in their official capacity. For example, journalist Sean Parnell used the Act to obtain access to documents sent to then Prime Minister Julia Gillard conveying an earlier Prime Minister’s views on matters of government policy. He also obtained access to personal character references provided by then Minister Anthony Albanese. Parnell was granted access to these documents because they related to governmental matters – that is, receipt of input to official policy-making and the use of official government letterhead for a reference. In contrast, Parnell was refused access to diary entries for Julia Gillard’s meetings with business leaders at an ALP conference. The meetings were part of a party political event and did not relate to the affairs of any government agency. What is the position of messages sent via WhatsApp? WhatApp messages are encrypted while in transit. However, they exist in material form and it is possible to access and export them from the phones on which they are located. There is therefore a strong case for arguing that they are subject to the FOI Act in the same way as email and others forms of text messages. As stated by the former Australian Information Commissioner Timothy Pilgrim, the Act is applicable to any document within its scope irrespective of how that document is stored, including on a messaging app or non-government server. This is consistent with the approach taken in Ireland and the UK. However, that does not mean that the use of WhatsApp is unproblematic from the perspective of FOI. If the FOI Act is to operate effectively, WhatsApp messages must be filed in such a way that they can readily be searched and retrieved. They must also be preserved consistently with the retention requirements in the Archives Act. It is unlikely that current practice is fully consistent with these requirements. If WhatsApp messages do exist, can be found and are stored in searchable form they are potentially accessible via FOI. But to call them up could involve huge workload requirements. Kevin's full and rich life detailed there, was Australia's first federal privacy commissioner and the foundation president of the NSW Administrative Decisions Tribunal and later Deputy President of the NSW Civil and Administrative Tribunal. And brought plenty of knowledge and experience to those jobs. Kevin had been head of research at the Australian Law Reform Commission 1976-1979 when one of its references was the ALRC's first on privacy. And Director of Policy and Research Victorian Attorney General's Department 1983-1985 when Victoria was the first state in Australia to introduce freedom of information legislation. Kevin was a warm, friendly fellow with a lively glint in his eyes every time you encountered him. When it comes to cleaning up Australian politics, some states are doing much better than others – and almost all are showing up the Commonwealth government. Grattan Institute’s State Orange Book 2018, released this week, compares the states and territories on the strength of their political institutions and checks and balances (among other things). Queensland and NSW received an A grade from Grattan for political transparency and accountability. Both have stronger rules than other states on lobbying and political donations. Western Australia, once a leader after introducing lobbying reforms in the mid-2000s, is now only middle of the pack. Tasmania and the Northern Territory are the poorest performers – both get an E for transparency of their political dealings. The Commonwealth government sits with them at the back of the pack. Some states and territories have made political lobbying much more open to the public gaze. NSW, Queensland and the ACT now publish ministerial diaries, so voters can see who is trying to influence whom, and when. All jurisdictions except the Northern Territory have a lobbyists’ register, and Queensland and South Australia require lobbyists to publish details on which ministers and shadow ministers they meet with. Most states have also introduced reforms to help voters “follow the money” in politics. NSW, Victoria, Queensland and the ACT require donations of $1,000 or more to be publicly declared. Only Tasmania has the same high threshold as the Commonwealth government ($13,800). Most states and territories require political parties to aggregate small donations from the same donor and declare them once the sum is more than the disclosure threshold. But Tasmania, the Northern Territory and the Commonwealth have left this loophole gaping. The disclosure threshold for donations should be no higher than $5,000 in all states and territories, and at the federal level. And donations should be disclosed quickly – preferably within seven days during election campaigns, as now happens in Queensland, South Australia and the ACT, or at least within 21 days, as in NSW and Victoria. Tasmania, and the Commonwealth, still leave us waiting up to 19 months to find out who donated to political parties during elections. Almost all states have improved their level of accountability to voters in recent years. All states and territories now have a ministerial code of conduct, setting out standards of ethical behaviour, including rules on accepting gifts and hospitality. And all have introduced a similar code for other parliamentarians, or are close to adopting one. The Commonwealth has a code only for ministers. But enforcement of the codes is typically weak, meaning the codes are more like guidelines than rules. In most states, the premier or the parliament ultimately determine sanctions for misconduct. Enforcement can easily become political. NSW and Queensland have independent oversight of their codes of conduct. The other states and territories should follow. And there should be meaningful sanctions for misconduct and for breaching disclosure rules – such as large fines or jail time, as applies in NSW. The states have also made progress in exposing and tackling corruption. All states and the NT now have dedicated anti-corruption or integrity agencies that provide some reassurance to the public that serious issues will be confronted. There is one on the way in the ACT. Only the Commonwealth lags in this area. It would be naïve to assume that corruption at the federal level is less prevalent or serious than at state level. Establishing an equivalent agency at the federal level should be a priority for the Commonwealth. The appearance, and sometimes reality, of political decisions favouring special interests or politicians’ self-interest has contributed to voter disillusionment and falling trust in government. Voters want their governments – local, state, and federal – to clean up their act and put integrity reforms high on the agenda. Reforming political institutions is both good politics and good policy. Every state and territory could do better by looking at best practice around the country. States and territories should fill the gaps we have identified in their transparency and accountability frameworks. They should also introduce a cap on political advertising expenditure during election campaigns, to help reduce the power of individual donors and free-up parliamentarians to do their jobs instead of chasing dollars. Most of all, our laggard Commonwealth government needs to lift its game. Federal ministers should be required to publish their diaries. A list of all lobbyists with security passes to federal Parliament House should be made public and kept up-to-date. Big donations to federal political parties should be disclosed in close to “real time”. And voters should have confidence that misconduct by federal MPs will be independently investigated and punished. Otherwise, the crisis of trust in Australian politics will only grow. Its been quite a week so you're excused if you missed the introduction into the Senate of the Freedom of Information Legislation (Improving Access and Transparency) Bill 2018 by Senator Rex Patrick (Centre Alliance). The senator is among the few who take a serious interest in transparency and accountability, evident in his time as a staffer to former senator Nick Xenophon, and in his own stead since he replaced Xenophon in November last year. Introduction of the bill took one minute of the senate's time but it won't automatically sink without trace. It has been referred to the Legal and Constitutional Affairs Legislation Committee for inquiry and report by 30 November 2018. Thus the opportunity to draw attention and advocate for action from those in government who since the election in 2013 have settled for words if pressed on the subject. While well short of the changes that would be expected if Australia embarked on developing information access laws fit for the 21st century, an OGP commitment on which the government has remained silent about what is under consideration since August 2017, Senator Patrick's bill is a welcome attempt to identify high order priorities for improvement. Allowing FOI review applicants to elect to have their matter bypass the Information Commissioner, who can take more than a year to make a decision on controversial issues, to the Administrative Appeals Tribunal. Granting an FOI applicant the right to switch a review into the AAT, without charge, in the event that the Information Commissioner takes, or indicates he or she will take, more than 120 days to make a decision. Preventing agencies from making submissions to FOI decision reviews that have not been advanced by the agency in its internal decision making, so that they can't switch exemptions half way through a review as often happens now. This would prevent a current practice that, in effect, this allows an agency to remake decision half way through a review, something not normally permitted in merits reviews being run in superior jurisdictions. Preventing the Information Commissioner from making FOI decisions if he or she does not hold the legal qualifications required of the FOI Commissioner (as happens now). Preventing agencies from publishing information released under FOI until at least 10 days after the applicant has received his or her copy of the information. Promoting the use of freedom of information requests by Senators and Members of the House of Representatives by entitling them to access to documents without charge unless the work generated by an access application involves charges totalling more than $1000. Requiring an agency to publish its external legal expenses for each Information Commission or AAT FOI matter that has concluded. This would apply in relation to agency FOI legal expenses and to expenses incurred by the National Archives in respect of applications made for access to information under the Archives Act 1983. Specific mention of The Accountability Roundtable is an acknowledgement of the tireless work of the former Chair Tim Smith QC in drawing attention to the Abbott and Turnbull governments' move away from the legislated model of three commissioners to exercise the functions of the OAIC and to downscale resources available for FOI and information policy. 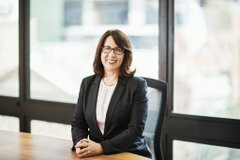 After acting in the positions since March, Angelene (apology for earlier typo) Falk was appointed Australian Information Commissioner and Privacy Commissioner from 16 August for a three year term. The appointment sees the government continue to hold fast to the decision that one commissioner not three as legislated is sufficient to manage the privacy, freedom of information and government information functions of the OAIC. This despite the rise and rise of privacy issues and concerns, the new regulatory framework under development for data management, the ongoing freedom of information battleground and road blocks, and the disappearance from public view at least of the OAIC contribution to information policy-the most recent publication on the website is four years old and the rest much older. Government also maintains silence- now for 12 months- on a commitment to ensure information access laws and practices are fit for the 21st century. In an in-tray (more probably in an archive box) somewhere in Canberra are a pile of recommendations put forward over the years by the OAIC and others on how to improve and enhance public access to information as well as the functions of the office. Once we've finalised the report in the next week or two, we will put a report to the Attorney again....and then government considers that. I think the appointment is an acting arrangement for three months, so we have until around the last week of June to ideally have a new Office of the Australian Information Commissioner, Privacy Commissioner and FOI Commissioner. I think there's an option of renewing (the acting appointment) if that's not the case, but that's our timeline. We're working to that, if I may say so, as diligently as we can." Still no news on this in the first week of August. The OAIC has been underfunded since 2014 and will continue to be undermanned, even when a commissioner is appointed to carry out functions parliament decided warranted three commissioners. Freedom of Information is the usual battleground. 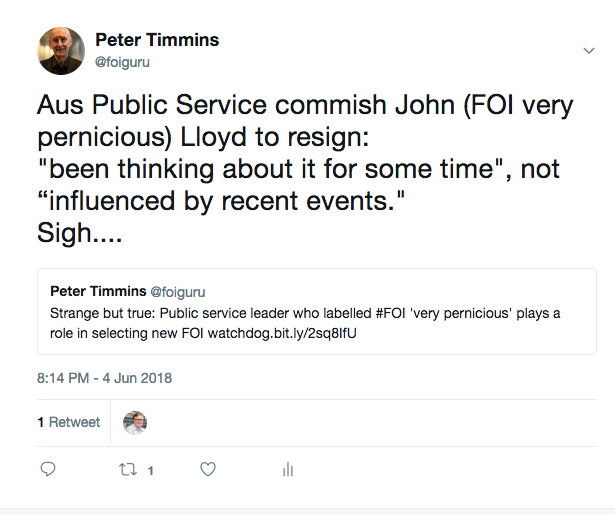 Australian Public Service Commissioner John Lloyd, who in 2015 labelled FOI 'very pernicious' and showed no appreciation of the role FOI plays in a democratic society, is on the selection advisory committee that will soon report to and recommend to the Attorney General a replacement Australian Information Commissioner. Senate Estimates (pages 51-60) hearings last week on the Office of Australian Information Commissioner covered a lot of ground (more in another post) and revealed the process is in the final stages, interviews are complete and an announcement is expected before the end of the month. In addition to the commissioner, members of the committee are the Secretary of the Attorney General's Department (Chair), Secretary of the Department of Health, and the deputy CEO of the Digital Transformation Agency. The APSC guidelines are that the APS Commissioner or his representative must be included in a selection committee for recruitment or appointment to a Senior Executive Service position. Usually the commissioner himself is involved for a band 3 position such as this. It seems bizarre that Mr Lloyd would put himself forward for a role on this occasion. Categorising FOI as pernicious-"extremely harmful, damaging, detrimental, deleterious" was bad enough from a leader of the public service. A former attorney general said at the time Mr Lloyd "either has no understanding of the importance of FOI laws in a modern and transparent democracy or he is trying to undermine the legislation with his comments." Mr Lloyd topped it off a few months later telling a Senate committee that FOI as originally conceived was intended ('particularly') to provide access to information about an individual's dealings with government, and that the law had expanded in the wrong direction since, completely missing the point that the right to access government information enshrined in FOI law is about transparency and accountability and a cornerstone of democracy. Mr Lloyd's views about the 'very pernicious' impact of FOI may have been reinforced in the last few weeks as he found himself in the hot seat in a seperate Senate estimates hearing arising from a decision by the Department of Prime Minister and Cabinet to refuse access to an FOI request arising from his correspondence with former colleagues at the Institute of Public Affairs. Mr Lloyd said he was not involved or consulted about the FOI. He confirmed after two days of questions in estimates that he is not under investigation, something alluded to in the PMC decision. The OAIC and its important role in access to government information, privacy protection and information policy was under direct attack from 2014 to 2016 and has been underfunded since, operating with one commissioner instead of the three parliament legislated for. The government apparently has no intention of addressing that hole in the system-hardly in line with executive government responsibility to execute and maintain the laws of the Commonwealth. Timothy Pigrim, now Angeline Falk and staff have soldiered on as OAIC responsibilities particularly in privacy protection have expanded, privacy issues have heated up and the office is to have a new role and some additional funding and resources for consumer data rights. Information policy and FOI have been and remain the poor relations, the former disappearing in recent years and the latter marked for example by long delays in completing review applications, little public advocacy about the right to know, and two own motion investigations into what particular government agencies are up to in carrying out their FOI functions during the last six years or so, the most recent in 2014. Living in hope, I'm sure others involved in the selection process particularly the Attorney General who has the last word, have a broad, deep understanding of the importance of FOI and the need for ongoing positive strong leadership in the long open government journey. Labels: Freedom of information Commissioner., OAIC. The following suggestions for commitments, if supported ,require refinement to ensure any commitment is specific, concrete and ambitious.We should learn from experience with the first plan that vague statements of intended outcomes and plans to review and consult do not meet this OGP requirement. A national integrity commission and a suite of anti-corruption reforms not limited to those included in the first national action plan yet to be delivered. The Deputy CEO of the OGP Support Unit Joe Powell urges countries preparing a plan this year to include anti corruption measures. Address gaps and weaknesses in lobbying and political donations regulation. Measures to include a comprehensive scheme for registration of lobbyists, periodic reporting of lobbying activity. Join Parliament in the open government initiative with a commitment to adopt a code of conduct for parliamentarians and an open government oversight committee. Pick up from where Commitment 3.1 in the first plan leaves us. The published information provides no information about what AGD has brought to the attention of government on this commitment. Those consulted a year ago provided many suggestions for improving and modernising law policy and practice. Recommendations from the Hawke review and the ALRC report "Secrecy laws and open government in Australia" have not been acted upon. placing it 57 of 112 laws surveyed. Regardless of the accuracy of this rating the law is middle of the pack, not near international best practice. Extend pro-active publication requirements- grants, gift registers, appointment diaries for example. Many requirements for disclosure in annual reports should become quarterly or continuous disclosure obligations. Legislate for open data release including publication of agency data set holdings, publish data sets in machine-readable formats and require updating on a regular basis and confer rights to seek review of agency practice and decisions. The low level of awareness of the OGP initiative and the limited contributions to discussion of possible commitments means few sector specific issues have been raised to date. Pick up on where commitment 5.2 leaves us. "As part of our first Open Government National Action Plan, we developed a new government framework that helps make sure that people are heard as government makes decisions or delivers services." In fact all that has happened so far is the Department of Industry Innovation and Science has published a report. Adoption of a new model is the next step but we do not appera to be there yet. For the first time in 2017 the survey includes a ranking for Australia. "Australia provides limited opportunities for the public to engage in the budget process." Two of 16 points required for eligibility to join the OGP are based on the IBP score. and other legislation. In practical terms encourage and empower civil society to engage and collaborate fully with government. 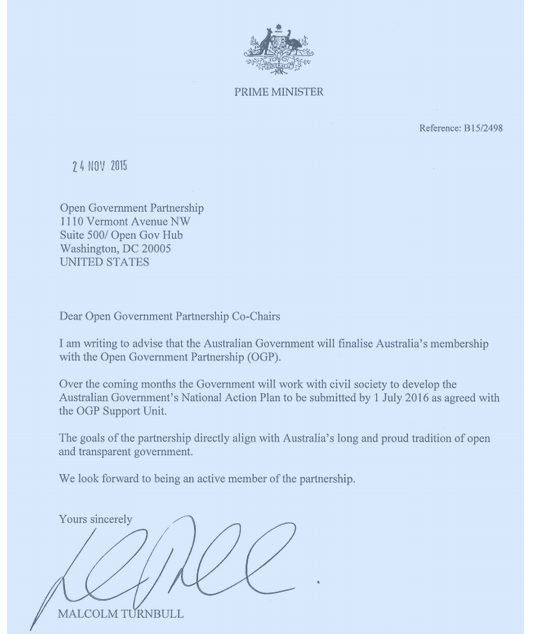 The Government committed to the Open Government Declaration in November 2015. The declaration states: "..We commit to making policy formulation and decision making more transparent, creating and using channels to solicit public feedback, and deepening public participation in developing, monitoring and evaluating government activities. We commit to protecting the ability of not-for-profit and civil society organizations to operate in ways consistent with our commitment to freedom of expression, association, and opinion..."
The Australian Government was party to a Joint statement on Protection and Promotion of Civil Society issued in Washington on 23 September 2013 supported by 23 other governments. after meeting with civil society and other groups in New York. Parliamentary privilege and the spirit of 1688.